Methionine sulfoxide reductase (MsrA) reduces methionine sulfoxide (MetO) residues in proteins and free MetO to Methionine (Met). The catalytic activity of MsrA is dependent of bound metal and cofactors but it requires reducing equivalents from either DTT or a thioredoxin-regenerating system. MsrA plays an essential role in protecting cells against oxidative damage. 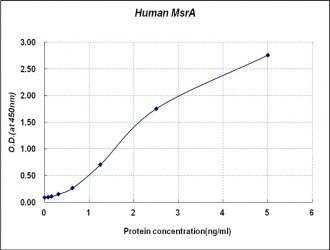 The substrates of MsrA include calmodulin, HIV protease and 1-proteinase-inhibitor. Recent studies indicate that there is a connection between MsrA and Alzheimer’s disease in mammals4.